Last year we missed our visit to La Muela. This year, we - that's Kev Newton, Vic Eldridge, Andrzej Tabero and myself - were back! We did it differently this time. Instead of sailing over to Bilbao, we flew to Madrid with our models in sport tubes. To get around we hired a Vito. Normally we stay in Guadalajara, but this time we rented a villa in a sleepy village close to the hill. It worked out pretty well. The only thing we missed were our electric models (not enough room in the Sportubes). La Muela is a fantastic site, but it can get up to some tricks - the temperature can change wildly from day to day, and the wind can shift 180 degrees at the drop of a ballast slug. I think this year would count as above average for F3F, with eight rounds flown over the three rather thermic days. I'll leave the blow by blow account to others, suffice to say that most of the flying was done off the NE face directly over the village (Alarilla), and Day Two was the best in terms of conditions. The competition was won by Pierre Rondel flying a Shinto. Pierre displayed 100% controlled aggression, extracting every bit of available energy from the air. 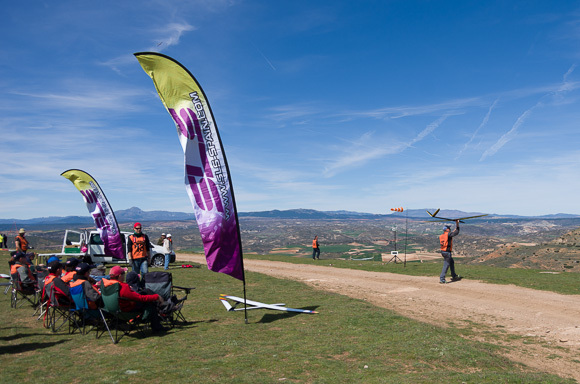 Meanwhile, second-placer Iñaki Elizondo flew in his usual exciting style. His 33.72 second run was as entertaining as it was impressive. In third place was Jose Luis Alvarez, a deceptively smooth, fast pilot who's always a pleasure to fly with. Fastest time went to Pierre with a 33.62 in Round 7. As for me, I was delighted to win Round 3 flying my trusty Sting, helped by some unusually energetic air. My thanks as always to the organisers Miguel Angel Torre Ratia, Miguel Medina and all the other helpers for keeping things on track for three days including manning the bases. Muchas gracias! Outside of the competition, La Muela is also a sport flyer's paradise. We were a little limited without our electric models, but a lot of fun was had combating our Wildthings (masterfully constructed by Vic). It was a very different holiday to usual, and a lot of fun. Roll on the next trip!